Human conflict and war affect people in many ways, in turn, civilians, soldiers and environments are often permanently scarred. The healing and rebuilding of communities can be a slow and painful process that requires compassionate people, organizations and companies around the world who want to see these people prosper and help them to rebuild. 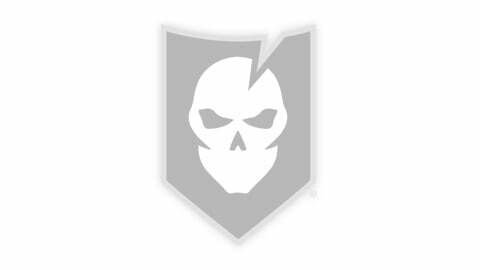 Combat Flip Flops is one of these companies. 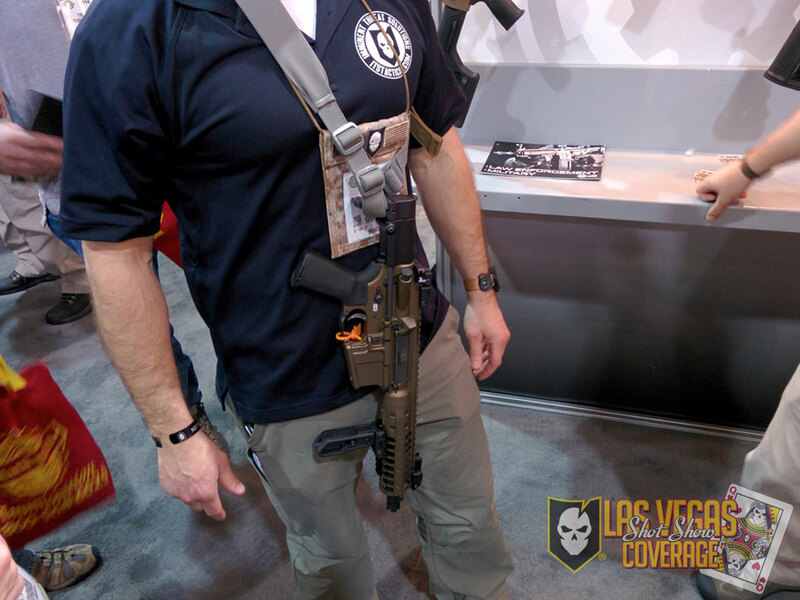 We’ve highlighted before that CFF is an American company formed by two Army Rangers who are very familiar with the physical state a region can be left in after war. I recently had the pleasure of visiting with Griff, one of the owners and founders of Combat Flip Flops, who reiterated that they’re committed to “building something worth talking about.” They’re doing this by helping communities in war torn areas find a means to earn a living through peaceful commerce. For anyone not familiar with CFF, they began their “Business, not Bullets” campaign by manufacturing flip flops in Afghanistan after seeing the positive effects that thriving small businesses were having on the Afghan community. “The money pumped into the economy got Afghanis to put down their guns, learn a trade, and work to improve their local environment.” Production was brought back to the United States out of necessity, but additional opportunities for commerce have opened up to help not only the communities in Afghanistan, but also now in Laos by helping to clean up land mines. During the Vietnam War the U.S. dropped hundreds of millions of cluster bombs on Laos in an effort to prohibit enemy movement along the Ho Chi Minh Trail. Cluster munitions have a very high failure rate, which means that the bombs didn’t explode upon impact and still have the potential to detonate if moved or disturbed. Up to 85 million of these cluster bombs dropped on Laos failed to detonate when they were dropped, leaving unexploded ordnance (UXO) scattered throughout the country. 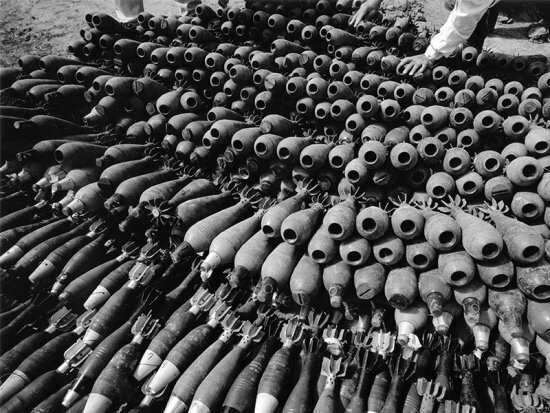 More than 50,000 people have been injured or killed because of UXO since the 1960’s. A large number of the people who’ve been immediately impacted by the explosions are children, simply because of their curious nature when they find the UXO on the ground. Other injuries and deaths have been caused by attempts to collect the metal from the bombs to be sold as scrap. The effort doesn’t stop there. 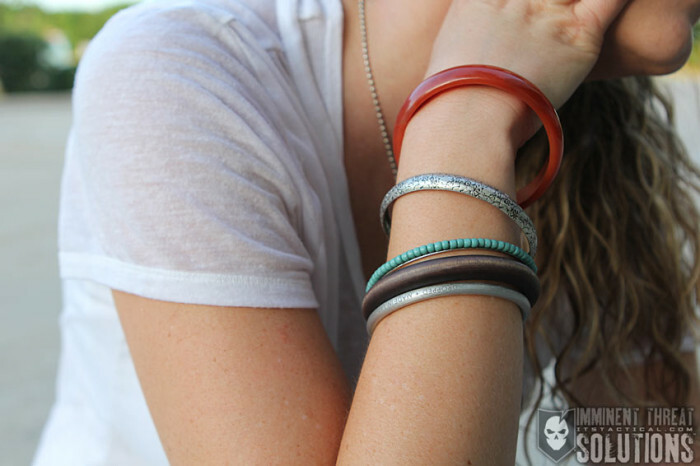 Elizabeth Suda, founder of Article 22 in New York, works with Laotian artisans to transform UXO into jewelry for peace. The aluminum from the bombs is fired in a kiln with additional metal from war scrap, so that any toxins are completely burned off. 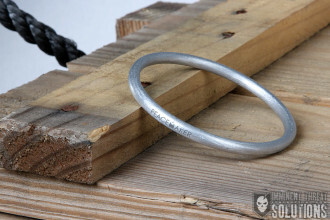 The metal is then hand-cast into jewelry. These handmade pieces of jewelry from UXO in Laos not only provide jobs to the artisans making the jewelry, but with the sale of each piece, a donation is made to help clear more land from mines. This allows Americans to “buy back the bombs,” so to speak. 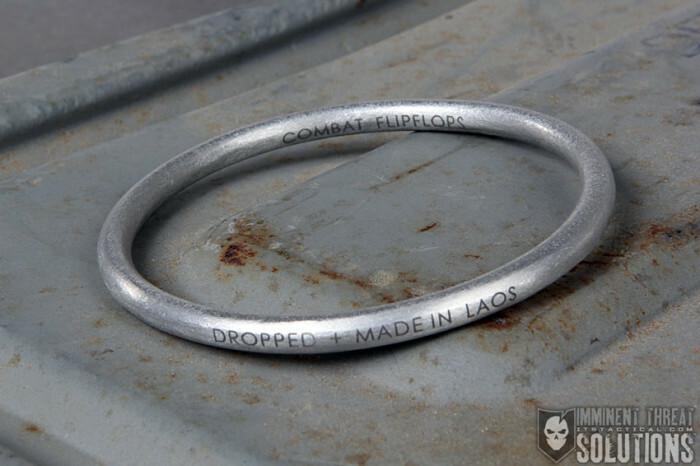 Combat Flip Flops has joined the cause for clearing the land in Laos and promoting additional commerce for the people there, by adding the Peacemaker Coin Wrap and the Peacemaker Bangle to their globally conscious line of products. 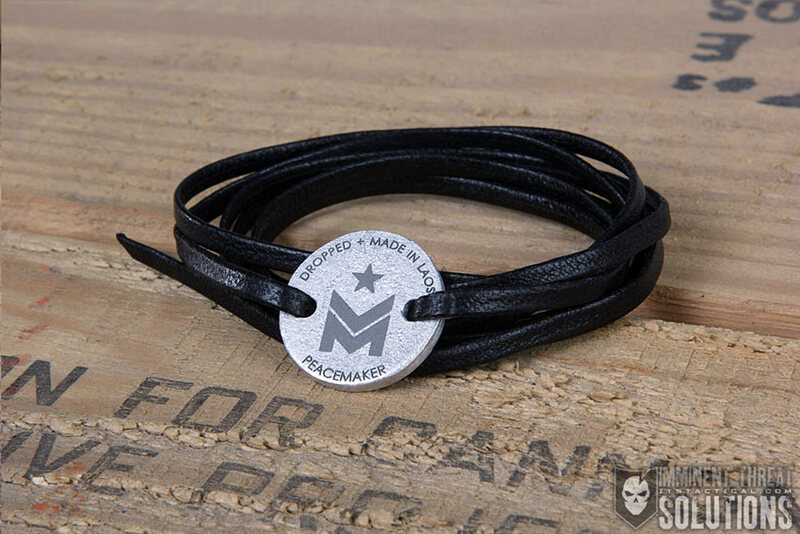 The Peacemaker Coin Wrap is made of UXO, war scrap and lambskin. The lightweight metal disc features the Combat Flip Flops logo and the inscription “Dropped and Made in Laos” to remind the wearer of the history of what’s being worn. The lambskin leather wrap ties around the wrist making it completely adjustable to fit anyone. I’ve been wearing this bracelet every day for about three weeks. 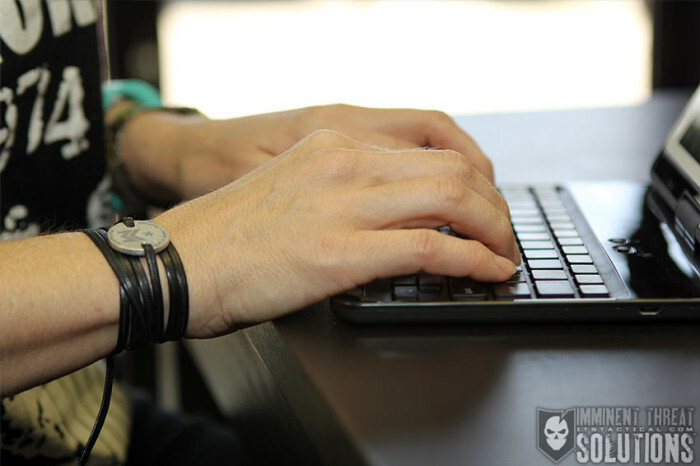 I typically wear a silver cuff on my right wrist, but I was intrigued by the unique look of the Coin Wrap and wanted to see if it allowed more air flow through to my wrist than a regular metal bracelet does during the hotter months of the year. 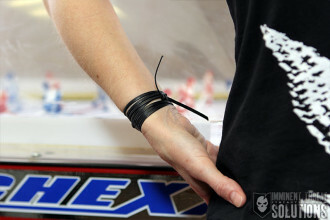 I’ll admit that when I first put on the Peacemaker Coin Wrap, I fumbled with the leather tie for a few minutes. 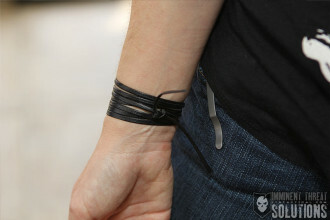 Once I got the hang of tying a one-handed square knot, putting the bracelet on became fairly simple. The coin wrap is so light weight I hardly feel it, it’s very comfortable and the leather is so soft against my skin. 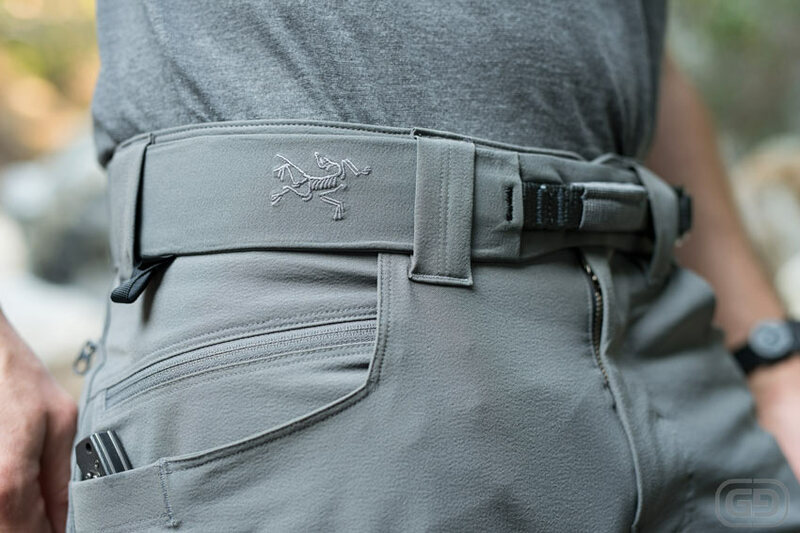 It ‘s really a great accessory for summer because of how much it lets my skin breathe. I’m a big proponent for spending money on products that help others when I can. I buy from independent artisans and local businesses as often as possible, which sometimes translates into spending a few more bucks in order to support a local economy or a cause. Knowing the history of the UXO, acknowledging the combined efforts of the companies and people of Laos to recover and repurpose their land, turning something that was once a source of devastation into job creation and a creative outlet, makes the price tag of $50 much less than the cost of what happened to make this bracelet possible. 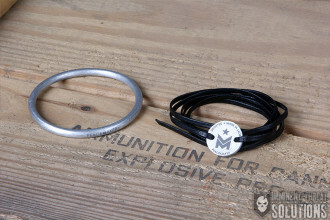 The Peacemaker Bangle is made completely from UXO and war scrap. I really like the Peacemaker Bangle for a couple of reasons. 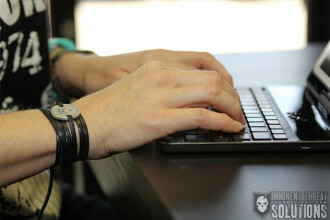 Out of all the bangle style bracelets I own, this is by far the most comfortable one. I actually slept with it a few nights and didn’t notice it at all. 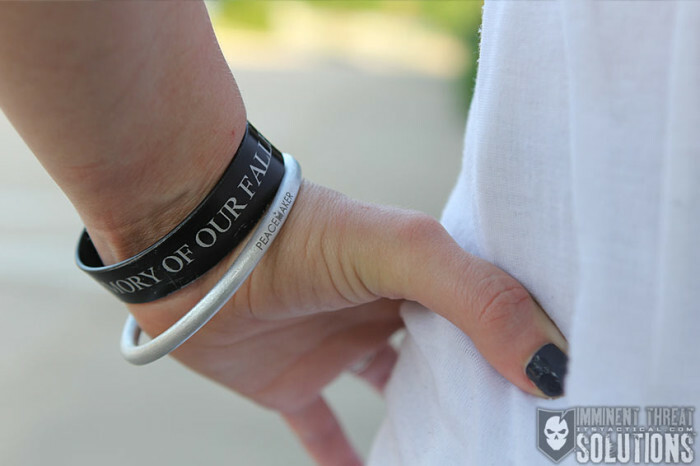 It also has some writing on the outside, which gives it a more casual look and illustrates the idea behind why a person would support buying this bracelet. The finish has a worn and brushed look which is nice because you don’t have to be concerned with denting or scratching it. 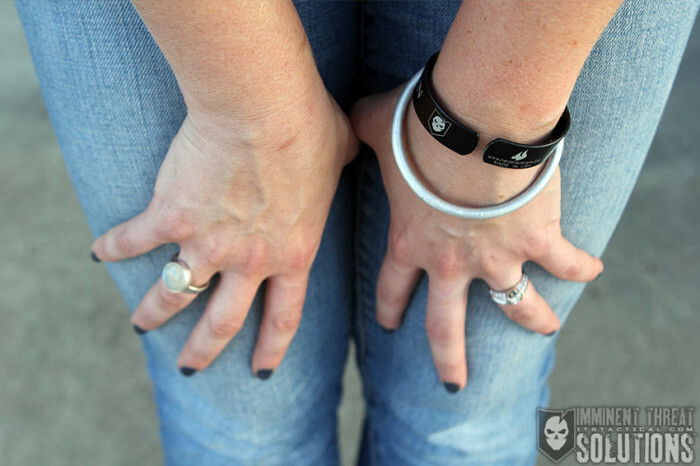 While it may be rough in appearance, it’s quite smooth and offers a very versatile look. It can be easily be worn by itself or with other bracelets through layering. I wouldn’t wear it to a more dressy event but found that I could wear it with just about anything else. 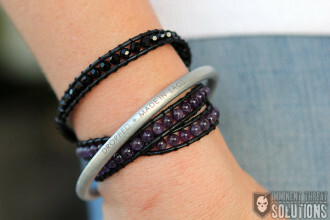 If you were to judge this bangle by looks alone, it probably isn’t worth the $50 price tag. 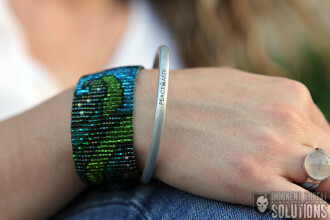 In fact, that’s more than I typically pay for a bracelet, but I’m also known to be quite the bargain shopper. What you have to realize is that the money going to a good cause. 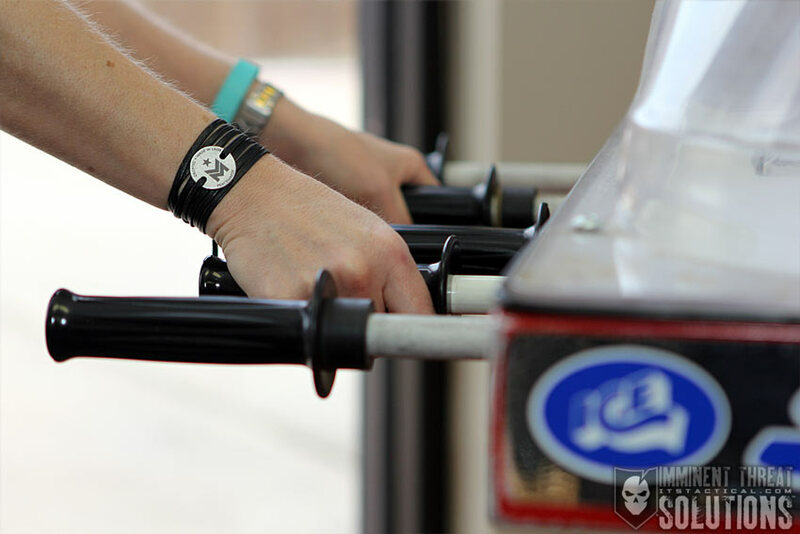 This bracelet is made from a melted-down unexploded bomb dropped during the Vietnam War. When purchased, the money not only goes to the person who handmade the bangle but also to a cleanup effort of unexploded bombs dropped on Laos. Areas around schools, homes and playgrounds are being cleared of this unexploded ordnance, which in return creates jobs and provides safety. These are both ideals that I can get behind. 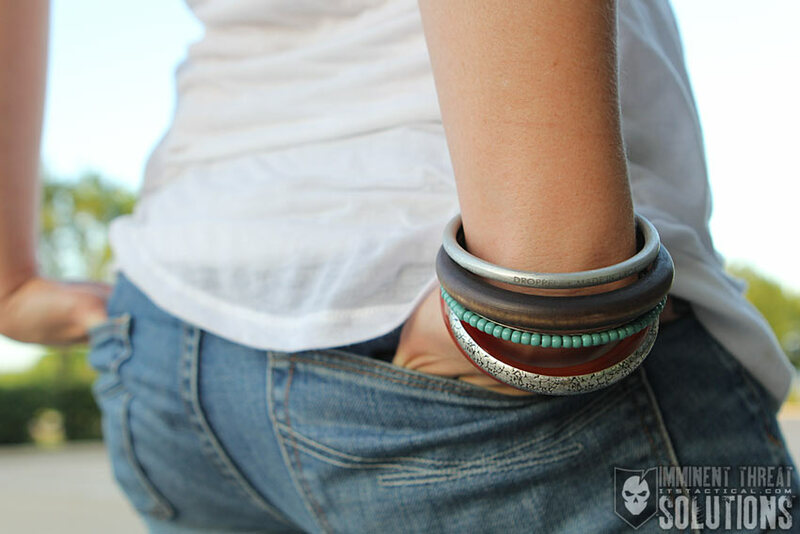 Because of its versatility, comfort and the cause that it stands for, I would certainly recommend this bangle to others. It would also make an excellent gift, especially for those that like bracelets that are casual but stylish. Be sure to check out the Peacemaker jewelry line offered by Combat Flip Flops for thoughtful, globally conscious gifts or personal accessory purchases. You’re not only helping support an American company, you’re supporting humanity.